Have you ever been to an open-air church service? Not those of the balmy British summerness where the vicar sets up a pulpit on the village green and children frolic in the duck pond while the ladies arrange the strawberries. But the sort where your church has been demolished, windows smashed, altar desecrated and many in the fellowship hacked to pieces by Islamists. The sort of open-air church service where you have no choice but weep in the dirt and croak your praises to God beneath the blaze of a stained glass sky. 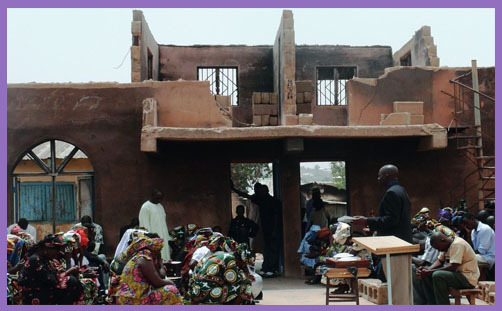 On 13th April, the international ministry Open Doors, which was founded by Brother Andrew to support persecuted Christians worldwide, welcomed over 50 parliamentarians to the launch of their report Crushed but not Defeated: The Impact of Persistent Violence on the Church in Northern Nigeria. You can read a summary of the event on the Open Doors website. The situation remains grave: Islamists are abducting children at gunpoint; kidnapping women, forcing them to convert to Islam and then marry; slaughtering thousands of Christians and torching their churches. First, Minister Dudderidge stated last month that religious freedom is protected in the Nigerian Constitution. Yet despite this it is violated in many parts of northern Nigeria. Therefore we ask that the UK urge the Nigerian government and northern state governments to ensure that equality before the law and the rights to freedom of thought, conscience and religion are implemented and guaranteed, and that all existing laws and regulations which restrict the rights and equality of citizens are repealed or brought in line with Nigeria’s international legal obligations. Second, we ask that the UK urge the government of Nigeria to conduct an in-depth investigation into the atrocities committed against civilians in northern Nigeria, paying particular attention to the vulnerabilities faced by Christians, and to bring perpetrators of violence against Christians and others to justice. If this fails, we ask that the UK call upon the UN Human Rights Council to mandate a Commission of Inquiry into human rights abuses in northern Nigeria. Third, an impressive amount of UK aid has been provided for Nigerian refugees and IDPs. However, we urge for an increased provision of international humanitarian aid to IDPs and refugees; for the UK to both support and urge the Nigerian government to increase the provision of aid to all persons affected, regardless of ethno-religious affiliation; and particularly to ensure that aid urgently reaches communities in the Nigerian states of Plateau, southern Kaduna, Nasarawa, Taraba and Benue, affected by Fulani Herdsmen attacks. Finally, we urge the UK to increase their existing work in monitoring and assisting the federal and state governments of Nigeria in the swift reconstruction of schools in north-eastern Nigeria, and to ensure that Islamic Religious Education is not considered compulsory for non-Muslims in Northern states but that sufficient Christian Religious Education is offered for Christian children in those schools. Will the UK Government hear? If they hear, will they listen? If they listen, will they act? Or will they simply nod piously over a cup of tea and give the usual FCO assurances that they are doing all they can, which isn’t very much at all. And why are our bishops and other clergy, along with many MPs, peers and seemingly the entire mainstream (even ‘right-wing’) media, all crying about 3,000 children from Syria who are “stranded” in the relative safety of mainland Europe, while many more thousands of Nigerian children are being summarily abducted, raped and hacked to pieces with no hope of escape to anywhere at all?